Have I mentioned I have an awesome father-in-law? 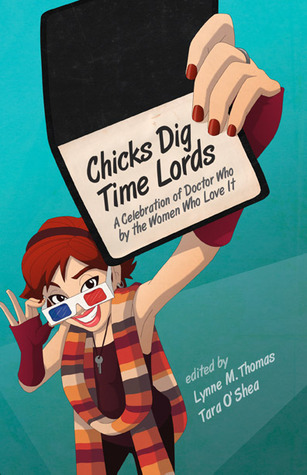 This year one of my Christmas presents was the book Chicks Dig Time Lords: A Celebration of Doctor Who by the Women Who Love It. I had put it on my Amazon wishlist once I found out about it a few years ago. It’s not a huge book, so I thought it would be a good choice to bring with me to Ohayocon to read during down time between panels. Boy, was I right. This book is a collection of essays written by women Who-vians. Jody Lyn Nye, Seanan McGuire, and Carole E. Barrowman are just a few of them. I decided to pick through and read what caught my attention instead of just reading it straight through. Why not? It was a good approach. Strike that. It was a great approach! Reading about how all these women got into Doctor Who and the fandom was really inspiring. Some got into it watching it on PBS. Some started with the Ninth Doctor. Some were there at the beginning in Britain. Some talk about different aspects of the fandom. All of them talk about how it became a part of their lives, in one way or another. All of them made me glad to be a part of the fandom. 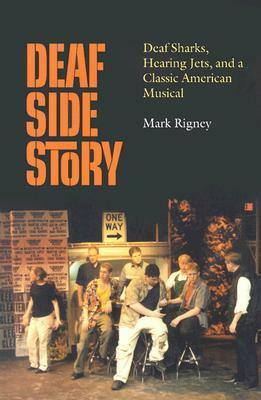 Right now I’m reading through it, again. This time with my notebook and pen nearby to write down thoughts and passages as I go. I wished I had that the first time, but there’s only so much you want to carry around at a convention. If you’re into Doctor Who, this book is a great read. I highly recommend it! This weekend I sat down and devoured this book. It is a wonderful book for anyone who is looking for inspiration when working with a room. It really inspired me to just let me be myself. That is what this book is all about, homeowners simply being themselves. I’ve seen a lot of people say how the rooms in the book aren’t undecorated. “They look like they’ve been professionally done!” is one I’ve seen a lot. Do they look like a camera crew simply went in with no heads-up and everything’s a mess? No. Each room is how the owner wants it to look ideally. But they definitely aren’t “professionally done” rooms. For me it was the icing on the cake for when I was working on my room. It helped me to look at my stuff and see it in a new light. And that really helped. Japanamerica is a great read for anyone who has an interest in any aspect of Japanese popular culture. The author talks about the history of aspects like anime, manga, and cosplay and talks with people in those professions and fans of those medium. I loved it. I now have a much broader appreciation of anime and manga. It really fills in a lot of gaps that, I’m guessing, many American otaku have in their knowledge of Japan. This book makes me want to visit Japan even more now. The various places he describes, the depth he goes into about the culture, I want to experience it for myself! Michael Pollan’s last book, The Omnivore’s Dilemma, launched a national conversation about the American way of eating; now In Defense of Food shows us how to change it, one meal at a time. Pollan proposes a new answer to the question of what we should eat that comes down to seven simple but liberating words:Eat food. Not too much. Mostly plants. 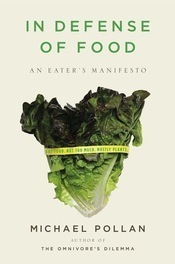 Pollan’s bracing and eloquent manifesto shows us how we can start making thoughtful food choices that will enrich our lives, enlarge our sense of what it means to be healthy, and bring pleasure back to eating. Yes, this is another reread. But it’s always a little different each time you read it. When I put serious effort into losing weight, I worshiped at the feet of nutritionism. I made sure I could figure out exactly how many calories I was eating per day. How did I survive, let alone lose weight?! Now I’m worshiping at the feet of whole foods and very minimally processed food. If it’s an imitation, chances are very low that I’ll eat it.